Just because you have a pet (or two or three…) doesn’t mean your house has to look like it. Messy Mutts makes fashionable and functional petware that fits right in with your décor. Founder Chris Shipton and his wife, Lauren, have two dogs—Daisy and Davis—who love the outdoors. They also love to bring the outdoors back inside with them and make more work for their humans. Like many of us, Chris and Lauren feed their dogs in the kitchen. 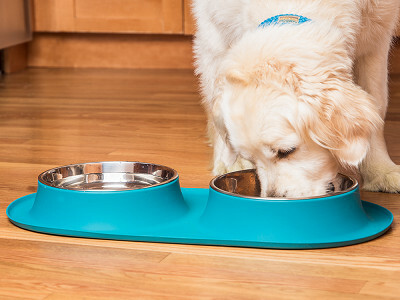 But after looking for stylish, practical food bowls for their dogs, Chris was disappointed in the selection. With 20+ years in the kitchen product industry, Chris realized that petware should fit into your home as well as kitchenware. So he created Messy Mutts. 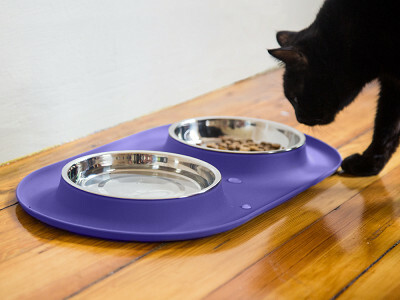 Their mess-catching, no-slip pet feeding stations look like something you’d eat out of, as Chris says. With Messy Mutts, living with your pets is much more fashionable. Hi everyone. I'm Chris, the Founder of Messy Mutts. I'm here to answer any questions you have! Why is the cat/tea cup dog sized one so much more expensive than the dog ones? @Monica Hi Monica, The cat version is actually a little larger in capacity and overall size. It was designed to be lower and wider to reduce whicker contact while cats are eating and drinking. @Chris I have always been told by my vet to have my cats food and water bowls elevated some, not sitting flat on the floor, so they won't be hunched over eating and drinking. But, I love the idea of it catching the messes! @Mike My first thought exactly! Those bowls are way to low. Do you sell the bowls separate? So they can be swapped out. My plan is to use this for the daily dry food for my cats. We're not carrying extra bowls, however, you can contact our Community Experience Team here. and they will be happy to let you know where and how to get them from Chris directly. Are there single bowl versions? I use an automatic watering dish already. I have this for my cats. I had to, one of my cats loves to scoop her food onto the floor! Thank you for making this! Sue. @Sue Hi Sue, Our pleasure, we are always striving to find solutions to help keep the mess to a minimum while delivering a a fun/happy eating experience for both you and your pet. Hi, I have 2 questions: my Yorkie is 6 lbs which size should I get? Are there other colors? The ideal size would be our medium range. There are other colours available and I am sure the Grommet team would be happy to help you on that front. Many cats won't drink from a water bowl near their food bowl. Individual bowls would work much better. @Tim Hi Tim, Please see Adam's note above regarding single bowls. As you know all cats and dogs are a little different and we look to satisfy all their needs. This is a good idea for a lot of dogs. For dogs that have a lot of hair on their faces like mine do, a flat dish would work better for the food part. Great idea though. My dog is a very messy eater, but he is 27" at the shoulder. Do you make something like this that is elevated? @Elizabeth At this point there is not one available. We however understand the need for such a design. @marilyn Hoping this will aid in your decisions. Medium: Capacity: 11.8 oz. per bowl; Dimensions: 15.75" x 9" x 2.5"; Weight: 0.97 lbs. Large: Capacity: 24 o.z per bowl; Dimensions:20" x 11.37" x 2"; Weight: 1.5 lbs. Extra Large: Capacity: 47.3 oz. per bowl; Dimension: 24" x 13" x 2.5"; Weight: 2.4 lbs. WE are animal activist, veterinarian , vet tech. R.N.s.....so we res cue many animals. We have 5 small breeds and 3 very large pit bulls and a huge Rottie .and several cats. Very excited about the dog dishes!!! One thing only stop us from buying multiple dishes......made in China!! I know all about trying to keep cost down and the importance of safe materials...but China is not safe for any animal or anything that has to do with animals , especially dogs and cats......as their history is well known....any country that has holidays to eat dogs should not be producing anything for our loved animals. Hi Darlene, thanks for the comment. You're right in that the likely reason for the manufacturing in China is due to Messy Mutts being new to market. Many of our Makers are looking for an affordable manufacturing option out of the gate. We certainly don't want you compromising your shopping values and encourage you to shop our Made in the USA collection. Our cultural differences are an entirely different conversation that does not impact the integrity and innovation of these products, but thank you again for your feedback. @Mike Hi Darlene, I appreciate your concerns over where the item is produced however all our products go through testing and we actually insist on materials that comply with FDA regulations for humans. Both the silicone and stainless steel surpass FDA standards. We want to offer quality to our beloved pets. Hi Margaret, great question! The silicone bottom almost acts as a suction. 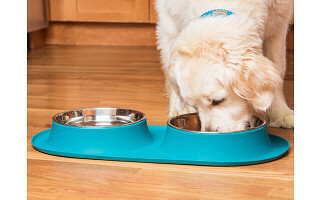 No matter if your dog steps on it or knocks into it, the feeding station and your dog's water and food will stay in place! Just because you have a pet (or two or three…) doesn’t mean your house has to look like it. Messy Mutts makes fashionable and functional petware that fits right in with your décor. Founder Chris Shipton and his wife, Lauren, have two dogs—Daisy and Davis—who love the outdoors. They also love to bring the outdoors back inside with them and make more work for their humans. Like many of us, Chris and Lauren feed their dogs in the kitchen. 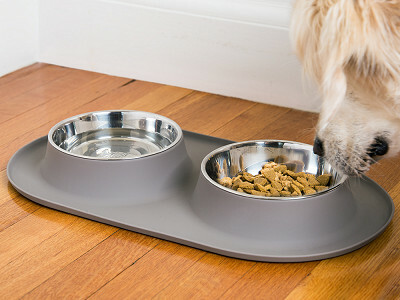 But after looking for stylish, practical food bowls for their dogs, Chris was disappointed in the selection. With 20+ years in the kitchen product industry, Chris realized that petware should fit into your home as well as kitchenware. So he created Messy Mutts.